(1) H4 LED headlight bulbs. Great quality. (3) 6th Generation. 360° beam angle. (5) There are 5 different colored applications: 3000K, 4300K, 6500K, 8000K, and 10000K, suitable for different weather environment. The latest series of fifth-generation LED headlamps with copper cooling are brighter, safe and traditional energy saving lights. LED LIGHTS Kit gives your headlights cool white (6700K), clean appearance with 3,000 lumens and a low 1.6 amps of current. 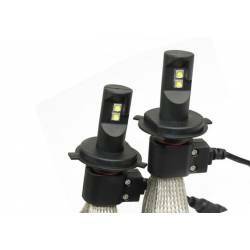 Two side-firing LEDs use all its reflector headlight, maximizing production. Flexible, tinned copper braid and copper core technology remain cooler operating temperatures and provide extra long life. Drivers waterproof can operate in a wide range of input voltage to a stable output. Easy to install kit 6 months, 2 LED lights with flexible stranded tinned copper sink, 2 connectors and 2 drivers. High-power LED lights generate a lot of heat, which can be harmful to your circuit. All SBL headlight bulbs come with heatsinking options that protect and extend the life of your headlights. This means that LED lights require extra space behind the lighthouse in order to function correctly. Be sure to check this area under the hood before ordering. This flexibility heatsink copper braid, tinned fits into the area behind the headlights and efficiently transfers heat away from the LED circuits. New, exclusive LED technology CREE has four flexible copper braid high quality thread that solve the problem areas of difficult adjustment many typical methods of heat dissipation of the LED headlamps. Braids can be expanded or contracted to fit a wide range of headlight housings, while the copper core technology keeps temperatures cooler operation and provides extra long life. Warning: Some high-class cars require decoders. Please feel free to contact us directly and buy the right decoder. *. Copper wire, high heat conduction, heat dissipation. Large area of ​​heat dissipation effect excellenther dissaption as good as a fan. *. Improve penterabilidad and light source.